Getting started as a freelance web designer or graphic artist can be very intimidating. Especially if you are like me and have had no formal education or training! However, there are a lot of great places to begin where your skills can stand in front of your experience. The following 5 sites are places where you can gain valuable experience, showcase your skills and potentially begin making money for doing what you love! Unfortunately these sites are not usually a great way to make stable or reliable income. You may do a lot of work designing a logo or web site for a client but then never receive any pay for your time. How can that be? Well you may have a lot of competition as these sites are designed to have many artists compete with each other to win the heart of the client. Typically businesses turn to these sites to have creative work like logos, graphic art, websites etc created. The client submits their needs and desires and then the freelance artists get to work to submit their ideas. The client eventually chooses one submission they like the most and that artist gets to take home the pay. Again, this is not a reliable way to make money as a freelance graphic design artist but is one that will allow you to gain experience. Experience that will help your business. Get your graphic design business off the ground using any of these 5 places. 99 Designs is a favorite to many freelance designers. Their high status has brought in business from many quality brands and their design submission process is treated very fairly as well as professionally. My experience with 99Designs has been very positive. However, the competition can be very high! There are a lot of excellent designers. If you are a newbie- I suggest keeping an eye on the smaller projects that don’t pay as well- your competition may be less! Freelancer has a section to their website labeled Contests. Here you can find where clients are submitting work requests for creative design work like logos and graphic art. Personally I try to stick with projects that are ‘guaranteed’ payment because it seems too simple for people to submit requests and never return to choose a winner or give any feedback. However, Freelancer’s system is easy to use and is great for new designers. Competition isn’t nearly as high as other sites. CrowdSpring is another highly respected site where design artists can get a great jump start! They almost always have several high paying projects. But again, if you keep an eye on those smaller paying projects- your competition may be very low (if any at all). Seems to me those high paying clients steal all the focus, allowing us newbies to sneak in and submit our great work to the lower paying clients without having to face hundreds of other submissions burying our own. LogoMyWay carries the same concept as the other sites listed above in that you submit design work and compete with other freelancers to have your work chosen and ultimately earn the money. However, logomyway focuses entirely on logos. I am always in shock when I visit LogoMyWay by the huge number of logo requests! I never knew there was such a high demand for logo designers until I began visiting all of these sites. LogoMyWay also has an application process that wasn’t too difficult to pass and just requires you have the necessary software and skills. MycroBurst is one site which I do not have personal experience with. I have heard quite a few things about them- many compare it to 99Designs and CrowdSpring. Looking through their featured Design contests it appear MycroBurst’s clients are paying very similar to other sites, ranging from $200-$1000+ for a logo. It definitely seems worth checking out. Again, I cannot stress enough, design contest sites like I mentioned are not a solid way to bring in an income as a new freelance graphic artist. But it is definitely a great way to learn the nuances of being a professional when working one on one with a client. 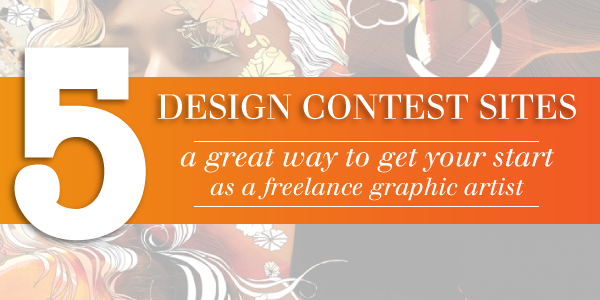 If you have little or no experience as a graphic artist then participating in these contests will give you some knowledge to the type of information that is important to gather from your future clients. It also gives you more experience as you face each design challenge. Participating in these contests allows you to see your competition’s work as well; studying top designers and seeing what works and what doesn’t can truly help give you the right design eye! I wish you all the very best on your quest to be a freelance graphic design artist!